The winners of the Russia4Brits competition are announced in London. Russia Local Ltd., a London-based consultancy firm headed by St Petersburg native Ignaty Dyakov, has just wrapped things up on its Russia4Brits initiative, a competition for children launched in the UK a few months ago. Children and young adults, aged 4 to 19, were invited to convey their knowledge of Russia and their thoughts on cooperation between the two countries in a creative way. Contestants had time until April to submit songs, poems, articles or paintings on a theme related to Russia, its culture and its image in the world today. It was not just the students who put a great deal of effort and thought into their entries. Their supporters – namely schools and parents –also joined the initiative enthusiastically, with contributions from the DAR Centre, Harrow School and James Allen's Girls' School. Russia4Brits was designed to offer UK children and young people the chance to have their say on Russia, its culture and society. Two winners, one per each of the two age groups the contestants were divided into, were selected. Another younger participant, Max Koschek from Churchfields Infant School, had the idea of drawing the Moscow tube map, a very easily recognisable symbol of the city. 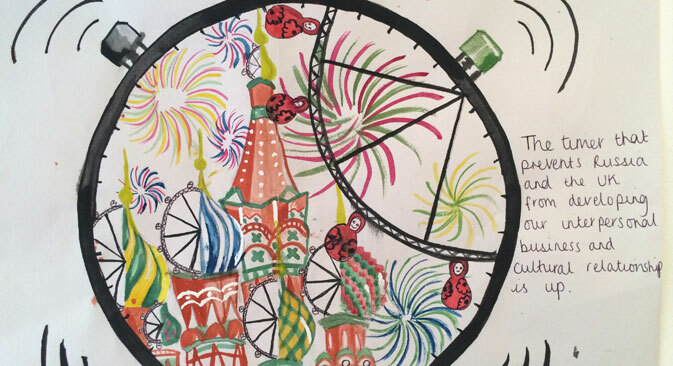 Alizhan Aldiyar from Harrow School in London, who placed first in the over 12 group, had the idea of drawing a modern Russian city, with Russia's past being mirrored in the water. Another thought-provoking piece was drawn by Elizabeth Sian Borrie, a student at Harris Academy, Bromley. Her picture showed a timer that, according to her description, prevents Russia and the UK from developing an interpersonal business and cultural relationship. With relations between Russia and the West growing strained following the Ukrainian crisis, Russia4Brits, which promotes itself as "a non-commercial, non-governmental initiative aimed at bringing children into the dialogue of two nations", did not come out fully unscathed by controversy. The project faced some trouble when the the Canary Wharf Group, the venue originally intended to house a display of works submitted within the frames of the competition, pulled out of the initiative, expressing reluctance to associate with a Russian project. "Although we had been advised on a number of occasions to withhold the competition, we felt it would not be right as to abstain from politics and to show some ideas beyond it was the primary aim of the competition. It would also not be fair to the participating children as they put so much effort and thought into their work", Dyakov says. The exhibition of best submissions will be hosted at GRAD Gallery in London 14 to 28 May 2014. Works will also be published on their website and websites of Russia Beyond the Headlines and Russian Art and Culture. Once upon a time I travelled by train from Vladivostok to St Petersburg - one of the longest train journeys of my life. There were only three days left, before I would be able to see my beloved grandma again. I had been moving very little for the past four days, and it felt like I would soon forget how to walk. Even in a T-shirt and trousers it was hot; for the past few days I hadn’t drunk enough water. My belly was protesting - I am so hungry! Mum and dad had stayed at home, they were busy. They hadn't explained to me the reason why they were sending me to grandma’s place so suddenly, so I was feeling quite anxious. For some reason I started staring at one of the seats; it seemed suspicious to me. I went closer to the seat. In the blink of an eye an Аmur tiger had jumped out of the seat, opened the train's door and got outside. I followed it with my eyes, but the weird tiger had already disappeared. So I resumed staring at the seat. This time I went even closer. But there was no tiger anymore – now Baba-Yaga was sitting there! It was not Baba-Yaga, it was Mama-Yaga. Everything that happened was just a dream.